Spirit treadmills are known for their product innovations. These treadmills belong in the mid-range price category. So if you’re looking to buy cheap entry level treadmills, this brand is not for you. But if you’re looking for feature rich treadmills, and you're not too worried about the price tag, then read this review. This might be the brand you’re looking for. Spirit was established in the early 80’s but it was not until the later that decade did they start selling fitness equipment. They once manufactured all their machines in the U.S. until Dyaco purchased majority of the company. Now, all treadmill productions are done abroad. Dyaco is a manufacturer of exercise equipment which hails from Taiwan. They are also the treadmill producer of Sole treadmills. The company has manufacturing plants in both Taiwan and China. Dyaco also has its own R&D department, which dedicate their time to the development of new and efficient equipment. This is probably the reason why Spirit is so known for their product innovation. Spirit treadmills belong in the mid-priced range category. Their treadmills are currently being sold at around $1,000 to a little over $2,000. With these price tags, you’ll get beautifully designed treadmills with lots of features and long warranties. Spirit needs to improve the quality of their equipment. In an effort to provide better features while maintaining its affordable price, Dayco replaced good treadmill parts with average treadmill parts and moved the production offshore which resulted to the decline of their machine’s quality. Lately however, the quality of Spirit machines have been improving. But so have most of their competition. As a result, their quality is still lagging behind other mid-priced treadmill brands. To conclude, Spirit Treadmills are affordable, great looking, and has nice features, but they have to improve their quality some more. If after reading my recommendation, you would still want to buy Spirit treadmills, I suggest you buy from Amazon. But before you buy, be sure to read our reviews of individual Spirit treadmills below. It would guide you in finding the Spirit machine that suits you best. Others: This is Spirit's entry level tradmill this year. This machine is ideal for leisure runs and moderate workout sessions only. Others: This machine is better for running, however tall people might find the 55 inch length of the running deck a little too short to feel comfortable in, especially when sprinting. Others: This is one of the better Spirit models in the market right now. This machine is definitely worth considering if it is within your budget. Below are some of the older Spirit Treadmills that have been discontinued. This site would keep these reviews here as some or most of these machines are still being sold online through auctions sites or classified ads sites. Others: the worst treadmill in the Inspire line. Others: this treadmill was definitely not worth its price. Others: similar to the IN100 but with an auto folding feature. 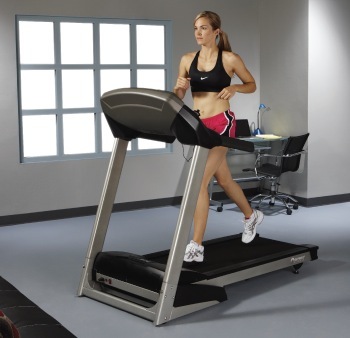 Others: this was the best treadmill in the Inspire series. Others: lacks the features that should be found in treadmills worth $1,000. Others: came with good specs and features while at the same time still being very affordable. Others: similar to the Z9 model but this was slightly better. Others: one of the easiest folding treadmill in the market during its introduction. Others: was another great looking Spirit treadmill with excellent folding feature. Others: was the non-folding counterpart of the Z500 model. It was also one of the better Spirit treadmills.